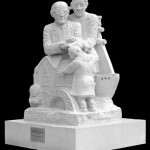 A wartime bureaucrat who saved thousands of Jews is being immortalised in stone by Corfe Castle sculptor Jonathan Sells. Frank Foley is finally getting the recognition he deserves. Despite being described as “a true British hero”, by Foreign Secretary Jack Straw, the role Frank Foley played in helping thousands of Jews to escape from Nazi Germany has remained largely unrecognised even in his home town. But all that looks set to change.